Dudgeon runs a small cow-calf operation in Knox County, Ohio, and he is not afraid to open his farm to visitors. He has given tours to students from nearby Kenyon College, many of whom have never set foot on a farm, let alone seen a cow. 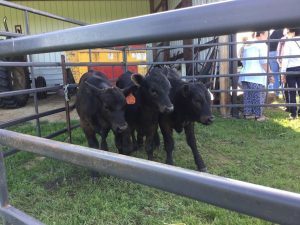 Dudgeon has also hosted the county’s Agricultural Awareness Day, that gives around 600 local fourth-graders a connection to the farm. And, as a member of the Knox County Cattlemen’s Association, he hosted educational events for the Ohio Cattlemen’s Association. 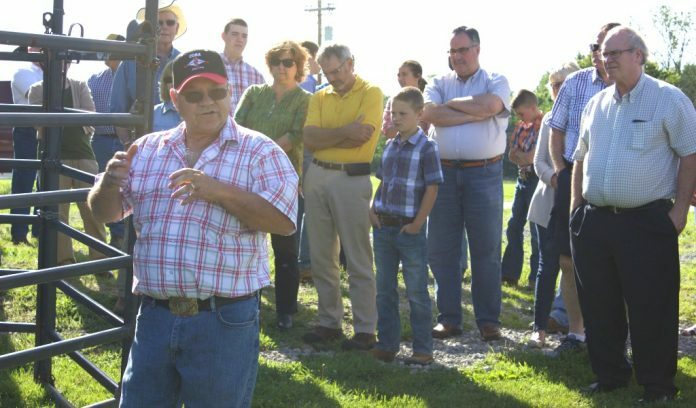 In late May, he opened up his farm to the Mount Vernon Rotary Club and members of the club were not shy about asking where their beef comes from. This is the second year the Rotary has visited the Dudgeon Farm, and Lynda Small, who attended with her Rotary member husband, said she enjoyed her visit last year, when they watched an artificial insemination demonstration. “This is a wonderful spread. They do a really nice job here,” she said. This year’s presentations focused on helping members make informed decisions when making purchases at the meat counter. Chuck Dudgeon showed off three of his most recent calving projects to members of the Mount Vernon Rotary Club, May 30, on his farm in Knox County, Ohio. He explained, one heifer was born as an embryo transfer (left), one was artificially inseminated (middle) and one was born naturally. “Anytime we can bring members of the community together with members of the farming community, it’s a positive thing,” said Lisa Schott, a Rotary member and managing director of Kenyon College’s Philander Chase Conservancy, a nonprofit land trust organization. Schott has worked with Dudgeon to preserve his 300 acres in an agricultural easement — meaning the land can be used for only agriculture. “When you look at this land 100 years from now, it is going to look basically the same,” said Schott. “And my vision will never change,” said Dudgeon, who runs 100 head of brood cattle — Angus and Simmental crosses — on the land. 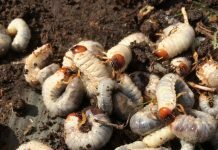 Dudgeon has, however, been changing some of his farm practices, dabbling in embryo transfer (ET) and artificial insemination (AI). Although not new to industry, Dudgeon said both ET and AI are a new and exciting challenge for him. He had three calves to show the Rotary members from his recent breedings — one born as an embryo transfer, one artificially inseminated and one born naturally. The heifer born as a result of the embryo transfer is rated in the top 1 percent for marbling, Dudgeon explained to the members. Marbling is what gives the meat its tenderness, its flavor and juiciness, explained Lyda Garcia, a meat scientist at Ohio State University. Garcia, faculty adviser for the Ohio State Meat Science Club and supervisor of the meat judging team, shared how she teaches her students to judge carcasses and various cuts of meat. She broke down why certain cuts are higher priced and more highly desired than others, and then challenged members to do some judging of their own. 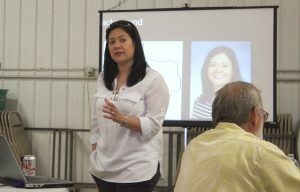 Lyda Garcia, assistant professor of meat science at Ohio State University, lead a discussion on marbling and grading various cuts of meat with members of the Mount Vernon Rotary Club, at Chuck Dudgeon’s beef cattle farm in Knox County, Ohio. Rotary members particularly wanted to know which was better for them: grass- or grain-fed beef. Garcia explained grass-fed beef takes longer to get to maturity, sometimes creating a tougher meat product. But grain-fed beef lack some of the extra vitamins that grass-fed beef take in. While grass-fed may contain slightly higher OMEGA acids, Garcia said the difference is too minimal to scientifically say grass-fed beef is healthier for you. At the end of the day, it’s really up to the consumer. “As long as you’re eating beef, I don’t care what you eat,” Dudgeon said. 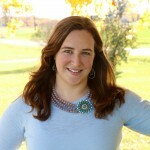 Korey Kidwell, Rotary president, said every fifth Tuesday is reserved for a special event, such as a visit to Dudgeon’s farm. “It provides local business leaders an opportunity to go some place new and learn something they probably didn’t know,” said Kidwell.